"All men are made equal", but the more I eat and try new food, I realise that those immortal words certainly don’t ring true about food. All food is different. Even the same food is different. For example, take the humble burger, one of the most hotly discussed topic amongst my food loving twitter friends. Open or closed, sauced or unsauced, cheddar or American, pink, how pink? With such a plethora of requirements and protocol around the humble burger, I guess it is unsurprising that many other comestibles have a strict list of points to make it “right”. Pizza for example. Oh boy, pretty much everyone has an opinion on pizza. Be it the cheese, the types of toppings, dough, sauce, how it’s cooked etc... The opinions are endless and often very polarising. In Naples, the self confessed home of the pizza, the standard is much more straightforward. The dough has to be made with 0 or 00 wheat flour (kneaded by hand), no more than 3 mm high. It must be baked in a wood fired oven. 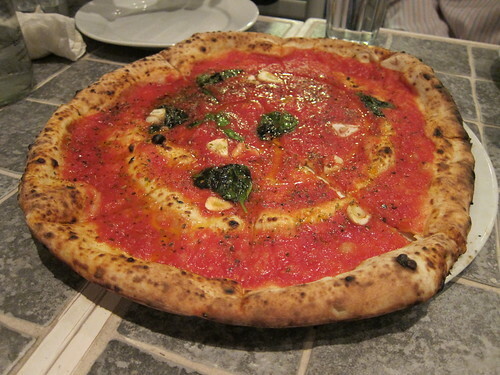 And finally, there are normally only two versions, a pizza marinara (which is made with tomato, garlic, oregano and extra virgin olive oil, or the pizza Margherita, made with tomato, sliced mozzarella, basil and extra-virgin olive oil. These are the foundations for proper Neapolitan pizza (check out the video, this guy is committed and the Chaotic Cooks in depth analysis on pizza history). Santa Maria is a tiny bolthole next to a pub which, I think it is relatively fair to say, is located in the middle of nowhere. Walking from the tube to the restaurant, you feel like you’re strolling through the heart of suburbia. It’s pretty handy being located right next to the pub as you’re going to be in for a wait, but when you finally get summoned, every second is worth it. Pasquale (one of the owners) is a staunch Neapolitan and is extremely proud of this product. Every detail in his kitchen from the tomatoes, to the dough to the oven are what he believes would meet the standards of a true Neapolitan. 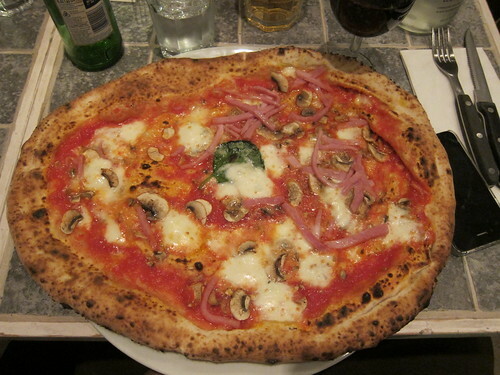 And even for someone who has never been to Naples in his life, it’s impossible to ignore the quality of his pizzas. One thing that surprised me were the selection of toppings available, not true to their roots necessarily, but essential for business I suppose. Either way, between the four of us, we strayed between the traditional (the Santa Bufalina) and the borderline cretinous (the Santa Carmela with ham and mushrooms which I ordered) with a few other bits and pieces. When the pizza arrived, it looked the business. The slightly scorched crust, the mingling of cheese, and the smell, wow. The first few bites, where the sweet concentrated tomato sauce takes turns with the creamy cheese and the soft yet crisp cornicione (or crust), are heady and memorable. I think I may have even smiled. The rest? Wolfed down in minutes. As a little pre dessert, we shared a marinara, with flecks of garlic, but a real chance to let those San Marzano tomatoes to speak for themselves. Even then, we soldiered on, finishing off our meal with some ice cream from the ever reliable Oddonos. Replete. Personally, I am not one to buy into this whole authenticity debate. In fact, I have been known to have a pizza with pineapple on it, but like with any food, as long as it makes me happy, it's ok by me. I loved Santa Maria, a lot in fact. The pizzas made me happy. 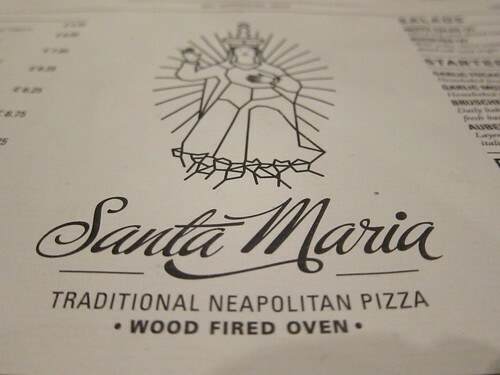 If you want a truly good pizza, regardless whether it is Neapolitan or some other incarnation, this is the place to come to and few things are good enough to make me travel this far West and make me start wondering when I can come back before I have even left. I like how they've put ham on one side and mushrooms on the other. I don't buy into this authenticity debate as, like you, as long as it tastes good then I'm happy. Pineapple on pizza - so wrong. Sadly I never got to eat in here as often as I should have, even I worked 5 minutes from here for 18 months. It's damn good pizza and ticks all my boxes. On the matter of authenticity, it isn't the be-all and end-all. Taste is. What I will say is, though, a dish does suffer if sub-standard replacement ingredients are used in place of authentic ingredients. In the case of pizza, this could mean crap cheese and rubbish tomato sauce. you make me want to eat pizza. Thanks for this recommendation. Went last weekend and loved it. Funny as I grew up & went to school plus lived very near to it. Lots of memories!